Charter The Ultimate Luxury Motor Yacht. 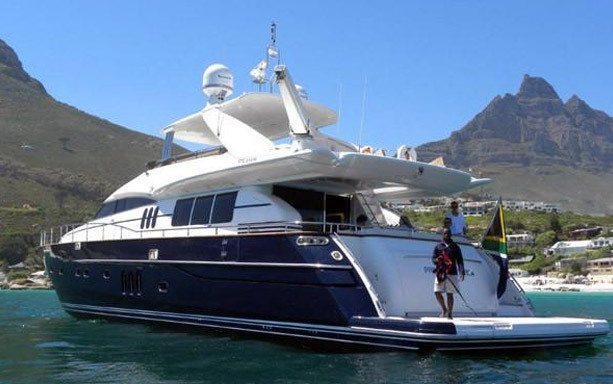 Power cruise the Cape Town waters from fabulous Clifton Beach to False Bay to the Langebaan lagoon in world class style and elegance while being entertained by the irresistible charm and cuisine offered on the Princess Emma. Moored at the V&A Marina. Africas most celebrated playground, the Princess Emma offers a most exclusive travel experience. At 25m and 88 tons, the luxury Princess Emma is designed for cruising, delivering exhilarating performance from twin 2000HP engines with a comfortable cruising speed of seventeen knots and a top speed of thirty knots. Built by Princess Yachts in the United Kingdom, she is equipped with state of the art navigational aids and safety equipment and is manned by a highly qualified skipper and crew. Four luxurious en-suite cabins, all independently air-conditioned, can accommodate eight guests. The rosewood and cherry finishes throughout combine with the luxurious soft furnishings to create an atmosphere of timeless elegance and unrivaled comfort. The wide aft deck offers alfresco dining for eight and the swimming platform provides easy access to the water. Sun beds adorn the spacious fly bridge and fore deck. Depart from the V&A Waterfront and cruise around Robben Island (weather dependent) before making your way to Clifton (also known as the Monaco of South Africa) which is the ideal place to spend a few hours at anchor onboard Princess Emma. On arrival you will be met by fully trained crew. Full crew and Stewardess. 15 Nautical miles. Selection of canapés, local wine, beers and soft drinks. Menu and refreshment list are available. Additional drinks or customised catering can be pre-arranged, at an additional charge. DJ / Entertainer - We have numerous DJs on our supplier list and are happy to facilitate that for you. Cape Town based singer/Entertainers details available on request.